Universal’s mountaineering epic “Everest” has launched impressively with $26.5 million in 36 international territories this weekend, finishing first in a dozen markets. The film, starring Jake Gyllenhaal, Josh Brolin and Jason Clarke, posted No. 1 openings in Argentina, Australia, Bulgaria, Hungary, Iceland, India, Mexico, New Zealand, Poland, Romania, South Africa and Taiwan. “Everest” opened Friday in the U.S. with a respectable $2.3 million at 545 premium large-format locations, putting it on track for a weekend debut of $7.1 million as the studio attempts to build buzz for a wide release next weekend. The film is directed by Baltasar Kormákur and written by William Nicholson and Simon Beaufoy. It’s based on the 1996 Mount Everest disaster and focuses on the efforts to survive by expedition groups led by Scott Fischer (Gyllenhaal) and Rob Hall (Clarke). The film, a co-production with Working Title, Cross Creek and Walden Media, opened the Venice Film Festival on Sept. 2 and has received solid critical support since then. It last screened at the Toronto Film Festival. In the U.K. and Ireland, “Everest” was runner-up to Tom Hardy’s “Legend” with $980,000, lifting its total to $2 million, including large-format screen previews. The pic has grossed $890,000 in Australia since Thursday, including previews. “Everest” has reeled in $2.2 million in Mexico since Wednesday. In Iceland, home to Kormakur, the film generated $32,000 at 11 sites — the second biggest opening day of 2015. Hologram pioneer Hologram USA — the same people who gave us the Tupac Shakur hologram at Coachella in 2012 — just announced its latest “digital resurrection” project: a new plan to bring dead stand-up comedians back to life using holograms. At a new Hologram Comedy Club being built as part of a new $18 million National Comedy Center in Jamestown, N.Y., tourists will have a chance to watch iconic comedy routines from some of the all-time comic greats — such as George Carlin, Rodney Dangerfield and Bob Hope — in an intimate comedy club environment. The big idea, of course, is that watching a live comic performance in a simulated comedy club environment will give people a better appreciation for a comic’s talent than just watching archival film footage in a museum theater or streaming comedy performances to a tablet or TV (think of those HBO comedy specials). By watching a full-scale hologram performance (10 to 12 routines of 4 to 5 minutes each), people will get a chance to experience how comics of an earlier era worked a room, the impeccable delivery of a well-timed joke, and the unique charm and charisma of a legendary stage performer. There’s obviously a lot of technological high tech wizardry required to pull this off. However, there’s another reason why comic holograms are so innovative — they could become a boost to economic development and tourism for cash-strapped cities looking to bring in new visitors. It’s no accident that the site of the planned hologram extravaganza is in Jamestown, N.Y. – that also happens to be the hometown of all-time comic great Lucille Ball, star of “I Love Lucy.” The town, located in southwestern New York State near Lake Erie, was once the “Furniture Capital of the World.” Fast-forward to 2015, and the city is looking for new ways to revitalize growth. The launch of the Hologram Comedy Club, then, is a play to attract more tourists to the area by building on the town’s long historical affiliation with Lucille Ball. The new comedy center has the backing of New York’s economic development officials, who view it as part of the state’s long-term tourism strategy and an extension of the iconic “I Love New York” branding campaign.New York Gov. Andrew Cuomo gave the National Comedy Center a $1.5 million grant to help make this hologram comedy magic happen. When you think about it, the economic development and tourism angle makes so much sense for other cities as well, not just Jamestown, N.Y. Imagine taking that same hologram technology and using it to sell out shows in once-proud industrial cities that have lost their manufacturing base or, quite frankly, cities in the middle of nowhere. All of these cities have local heroes and celebrities they could turn into holograms, just as Jamestown has capitalized on its history as the birthplace of Lucille Ball. Take Detroit, for example. In addition to some of the famous comedians who hail from the Detroit area (think Ed McMahon or Lily Tomlin), there are all kinds of musicians and entertainers who might make for some compelling holograms — Stevie Wonder, Eminem, Aretha Franklin, Kid Rock, The Supremes or The Temptations. The big question, however, is whether this hologram technology is really any better than just watching old TV clips on YouTube. Critics would say that today’s holograms are just a massively high-tech adaptation of the famous Pepper’s Ghost illusion that has been around since the 16th century. Watching a comic hologram routine as part of a sold-out audience might replicate the same type of electric feeling you get from seeing a comic live. But now imagine watching a comedian hologram in an empty room, or, even worse, in a room full of crying kids and stressed-out grandparents who are trying to teach their grandkids about their favorite comic legends. Hologram USA, though, is a leader in North American hologram technology, working on everything from the Tupac Shakur hologram at the 2012 Coachella event (still pretty much the classic example of hologram entertainment) to the touring Buddy Holly and Liberace holograms. That’s confidence enough that they will be able to pull this off when the Hologram Comedy Club opens for business in August 2016. The really fascinating part is how the combination of holograms and telepresence technology could make it possible for entertainers to be in more than one place at a time. In one proof-of-concept, Hologram USA partnered with Jimmy Kimmel in a telepresence experiment, in which Jimmy Kimmel in New York simultaneously appeared as a hologram in Nashville for the Country Music Awards. That might really open up some opportunities for holograms to change the world of tourism as we know it. Imagine concert tours in which entertainers headline in more than one city at a time. A New Year’s Eve performer, for example, could rock out simultaneously in New York, Miami and Las Vegas — or in any city in between. Who said that human capital wasn’t scalable? Holograms could be a game-changer for the tourism industry, since now all the action seems to occur in places such as Las Vegas, Orlando or New York — places where there’s a critical mass of tourists for entertainment companies to invest in expensive technology and plenty of venues to pack in the crowds night after night. But what happens if a hologram entertainment complex pops up in, say, a small college town that can nevertheless pack in more than 100,000 fans for big college sporting events? Wouldn’t a performer give the go-ahead for his or her hologram to put in an appearance if it could attract 100,000 paying customers? Celebrity holograms are interesting already, but still more interesting when you think of what they could do for the economic development and revitalization of celebrity hometowns across the nation. 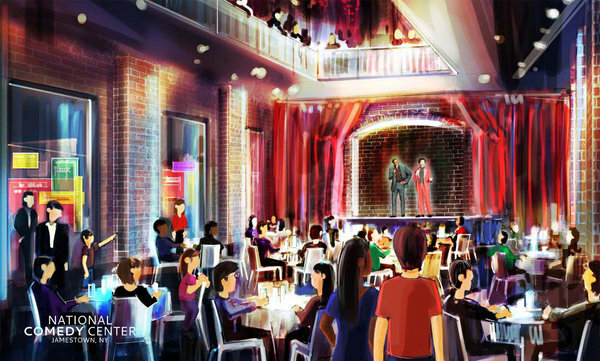 A rendering of a comedy club at the National Comedy Center in Jamestown, N.Y., that will feature holograms of stand-ups and comic actors from various eras. If you missed the chance to watch some of comedy’s greatest performers in their prime — whether because of scheduling conflicts, scarce tickets or the fact that you weren’t born yet — a new attraction in upstate New York wants to give you another chance to see them, at least in hologram form. The National Comedy Center, which is scheduled to open next year in Jamestown, N.Y., is to unveil plans for a comedy club that will feature holograms of stand-ups and comic actors from various eras. The virtual comedians will be created by Hologram USA, the Beverly Hills, Calif.-based company that has also made or is working on similar representations of Buddy Holly, Liberace, Julian Assange and Jimmy Kimmel. The club is hoping to spotlight comedians like Milton Berle, Bob Hope, George Carlin and Rodney Dangerfield, although Mr. Benson said deals with these artists’ families and estates were not set and an inaugural lineup could still change. The National Comedy Center plans a groundbreaking ceremony on Aug. 1. Its not-for-profit parent company also owns and operates the Lucille Ball-Desi Arnaz Museum in Jamestown, the city where Ms. Ball was born in 1911, as well as the annual Lucille Ball Comedy Festival. Mr. Benson said the club would probably have an “I Love Lucy” component, but emphasized that the center itself had a broader mission of celebrating comedy. Meanwhile, Mr. Benson said the National Comedy Center was also looking to provide a new home for a notorious statue of Ms. Ball, located in Celoron, N.Y., that has been widely mocked for looking nothing like the actress (and looking just plain spooky). PanARMENIAN.Net – Hannibal Classics has come on to sell the star-studded action-thriller “Bus 657” at Cannes. The heist movie, which stars Robert De Niro, Jeffrey Dean Morgan, Kate Bosworth, Morris Chestnut and “Guardians of the Galaxy’s” Dave Bautista, will be screened for the first time to world buyers, TheWrap reports. Described as a mix of “Dog Day Afternoon” and “Speed,” with the added twists and turns of such heist movies as “Ocean’s Eleven” and “Inside Man,” the movie stars Jeffrey Dean Morgan as Luke Vaughn, a broke father desperate to save his daughter’s life as her medical bills pile up. Vaughn soon turns to his boss, casino owner and retiring mob-boss Francis “Pope” Silva (De Niro), for help. Pope rejects his pleas, forcing Vaughn resort to other means. Facing an impossible deadline for his daughter’s life-saving surgery, Vaughn joins forces with a psychotic co-worker (Bautista) to rob Pope’s casino. When the daring heist goes awry, Vaughn and his partners take refuge on bus 657, taking several commuters hostage. The cops and Pope close in as Vaughn’s deadline approaches. Scott Mann (“The Tournament”) directed from a script by Stephen Cyrus Sepher and Max Adams. Randall Emmett and George Furla produced “Bus 657,” which was executive produced by Hannibal’s Richard Rionda Del Castro and Patricia Eberle. The film will be distributed in the U.S. by Grindstone Entertainment through Lionsgate, and final delivery will be available to international distributors in June. Founded in 2010 by Richard Rionda Del Castro, Hannibal Classics specializes in the production, financing and distribution of feature-length theatrical motion pictures with large budgets. A NEW film telling the story of Wearside’s answer to Lara Croft has won the approval of the woman who knows her best. Queen Of The Desert stars Nicole Kidman as Washington-born Gertrude Bell, the woman who worked with Lawrence of Arabia during First World War and played a critical role in shaping the modern Middle East. LIFE ON FILM: Known as the uncrowned queen of Iraq, Gertrude Bell was once the most powerful woman in the British Empire. Directed by Werner Herzog, the movie also stars Twlight’s Robert Pattinson as Lawrence; James Franco as Viscount Chelsea, Henry Arthur Cadogan; and Homeland’s Damien Lewis as Major Charles Doughty-Wylie, the married man with whom Gertrude had an unconsummated affair and who is believed to be the reason she never married. Jan Long has been fascinated by Gertrude’s story for years and led the campaign to get a blue plaque in her memory at Gertrude’s family home, Dame Margaret Hall. She was part of an invited audience at a private screening of the movie in London, at which Gertrude’s great-nephew Mark Bell spoke about living in the family homes that were inhabited by his most famous relation. Jan gave the new movie the thumbs-up, despite then fact it takes a few liberties with the actual history. I am thrilled that this film will at last catapult Gertrude Bell into the limelight and out of the shadows. “London was great fun and it was good to meet so many people with an interest in Gertrude Bell and, of course, Werner Herzog productions,” she said. “As for the film, it was visually stunning with wonderful landscapes and lavishly detailed costumes. Jan was full of praise for the woman charged with bringing her heroine to life: “Nicole Kidman shone and gave a very credible performance of how we imagine Gertrude to have been,” she said. STAMP OF APPROVAL: Jan Long with her invitation to the screening of Queen Of The Desert and a cigarette case which belonged to Gertrude Bell. “For those wanting to see a great love story and an extraordinary woman, this gorgeous film fits the bill exactly. “However, for the scholars amongst us, there were liberties taken with the chronology and some factual content. Gertrude smoked heavily, often rolling her own cigarettes, which she kept in a beautifully-inscribed silver case bearing the name “Gertrude (Margaret Lothian) Bell”. ORIENTAL SECRETARY: Gertrude Bell helped Lawrence of Arabia set up Iraq. Jan is now the proud owner of the case, which Gertrude used throughout her desert and world travels. She is unsure of the date and maker of the case and hopes a local jeweller or silversmith will be able to shed some light on its provenance, in order to solve the mystery of who presented it to Gertrude. GERTRUDE Bell was born in July 1868 in Washington Hall (later known as Dame Margaret Hall), the granddaughter of industrialist Sir Isaac Lowthian Bell and daughter of Sir Hugh Bell, who spent three spells as Mayor of Middlesbrough. She was educated at Queen’s College and went on to study history at Oxford University, receiving a first class honours degree in two years. After graduation, she travelled to Tehran to visit her uncle Sir Frank Lascelles, who was the equivalent of British ambassador in Persia. She spent much of the next decade travelling the world, during which time she became passionately interested in archaeology and fluent in Arabic, Persian, French and German as well as also speaking Italian and Turkish. She returned to the Middle East in 1899 and travelled repeatedly across the region in the following years. In her book Syria: The Desert and the Sown, published in 1907, she described visits to the likes of Damascus, Jerusalem, Beirut and Alexandretta. In 1909 she visited Carchemish, where she first met Lawrence. The pair were reunited in Cairo in November 1915, by which time they were both working for British intelligence. Gertrude became the only female political officer in the British forces and in 1917 was given the title of “Oriental Secretary”. She and Lawrence were among a group of experts convened by Winston Churchill in 1921 to determine the borders of British power and establish the borders of such new countries as Iraq. Gertrude was awarded the Order of the British Empire for her work in the region. Gertrude Bell died of an overdose of sleeping pills in July 1926, though it is unclear whether it was deliberate. She was buried in the British cemetery in Baghdad, her funeral attended by hundreds of people.